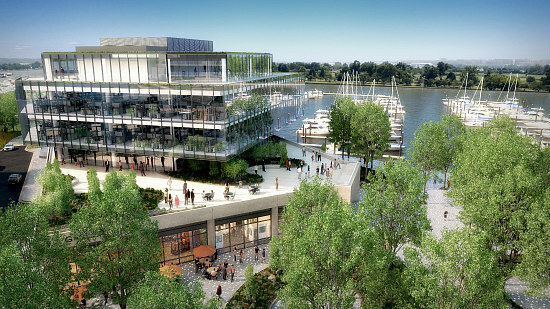 Nearly 18 months after the first phase of The Wharf debuted in DC, the second phase broke ground at the end of March. This phase includes an additional half-mile of development to the stretch of the Anacostia waterfront between the Washington Channel and Maine Avenue, from 6th to 11th Streets SW (map). The 1.25 million square feet of development will deliver on a rolling basis by the end of 2022. 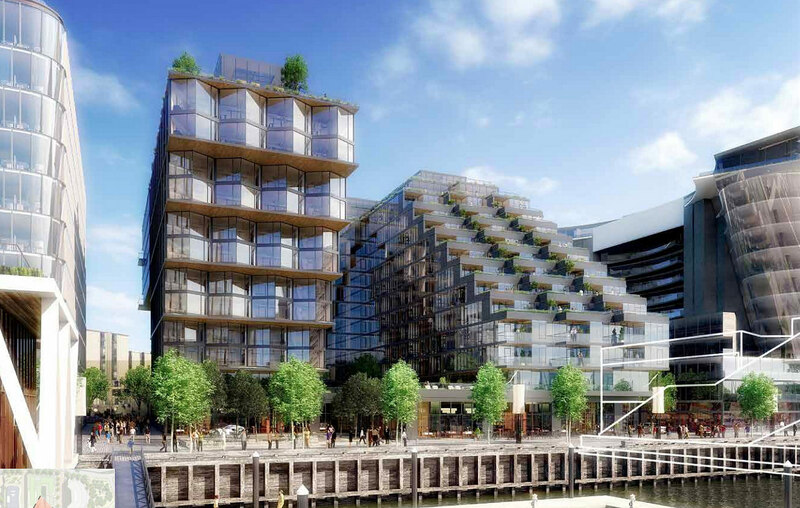 The completion of the second phase will also mean the addition of 223 boat slips at The Wharf Marina and the 1.5-acre M Street Landing park. Below, UrbanTurf highlights what most of that development will entail. Parcel 6 will contain a 290,000-square-foot office building and Parcel 7 will contain a 237,000-square-foot office building, designed by SHoP Architects and WDG Architecture. There will also be approximately 33,000 square feet of retail space between the two buildings. For Parcel 8, ODA has designed a dramatically cantilevered building that will deliver 255 rental apartments and 131 hotel rooms. On the ground and cellar floors, the building will contain 26,316 square feet of retail. Amenities will include a fitness room, lounge and courtyard with pool on the second floor; there will also be a rooftop bar, restaurant or lounge. 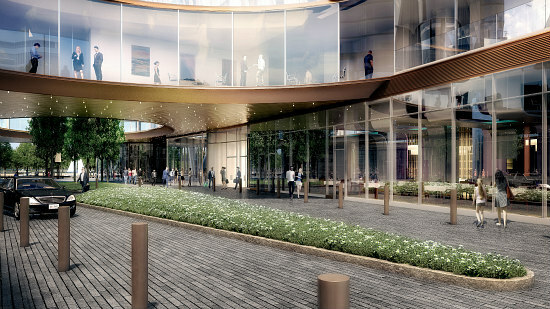 Next door at Parcel 9, Rafael Vinoly Architects has designed a 130 foot-tall condo building. Rather than the previously-proposed 82 market-rate condos, this building will now deliver 96 units atop over two retail spaces totaling 16,080 square feet. Morris Adjmi Architects has designed a building at Parcel 10 that will deliver 60,143 square feet of office space and 15,000 square feet of retail. 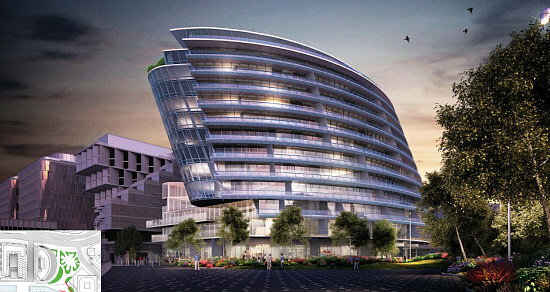 The Water Buildings will add retail, maritime services and restaurants to the strip. 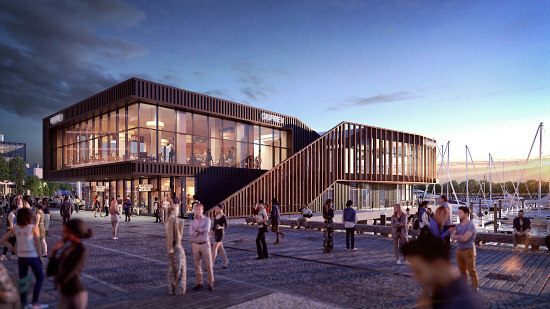 HWKN is the architect of this two-story building, which will contain a marina club on the ground floor, a restaurant above, and a rooftop terrace. S9 Architecture is designing Water Building II, which will contain 22,000 square feet of services and retail on the ground floor and a restaurant/bar on the floor above. 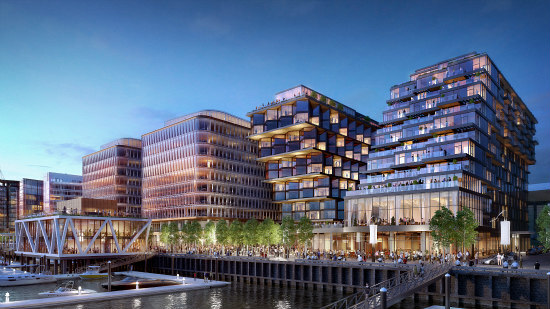 The building will sit between The Grove and M Street Landing and will have a green roof the architecture firm described as “an elevated extension of M Street Landing”.